We love making gifts with the kids. It’s such a delicious process. We get to spend time with the kids being creative. The kids are happy to have fun making crafts. The most rewarding moments are seeing the kids become excited about giving to someone else. The anticipation as they wrap the gift. The expectant look in their eyes as they watch their present being opened. The posture of pride that they emanate when their gift is appreciated. 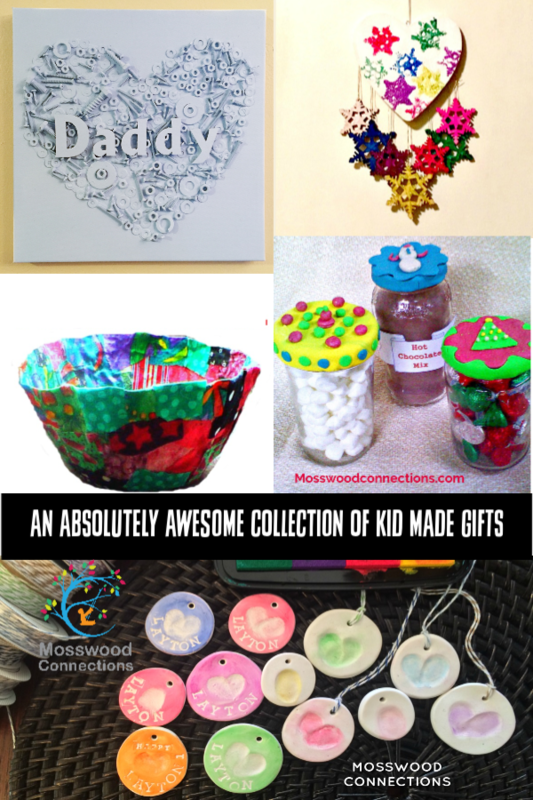 It’s all so good and that’s why we decided to gather our DIY gifts and put them together in this fantastic Collection of Kid Made Gifts. We love this project! 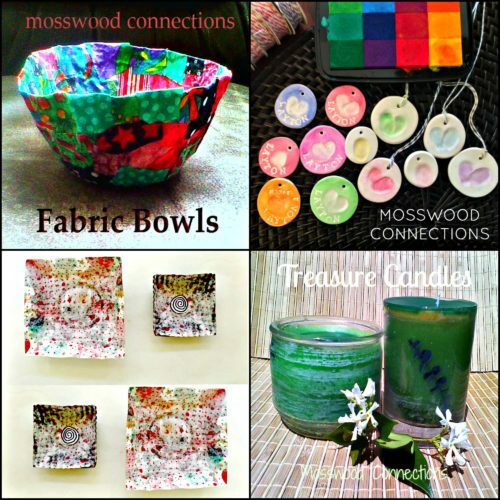 Making Fabric Bowls is a fun way to recycle fabric. We use this activity in therapy and at home with our own kids. A Fabric Bowl DIY gift will be appreciated by anyone who receives one for their home. Everybody loves fingerprint keepsakes, right? We have a thing for fingerprint, handprint, and footprint art projects. Little kid fingerprints and handprints are just so cute and art projects made with prints look super adorable hanging on the wall. That’s why we like it. The kids like it because it’s a fun sensory activity for them and they love the way the fingerprint charms look when they’re done. It’s a bonus that at the end of the art project you have some super cute kid-made charms. I got the idea for this project after someone gave me a pressed paper mache plate. It’s a fun sensory craft project that even very young kids can do. When I was a tween I loved making candles. Then someone gave me a treasure candle and I was absolutely entranced. Watching the small treasures appear as the candle burns is simply magical. Since that time I have shared my love of making treasure candles with the next generation. This year we decided to make mobiles with the kids. I got the idea from a nice young man who made me a mobile last year. He actually cut and sanded the heart for his mobile. Since I’m nowhere near as handy as he is, I simplified the project so the kids and I could have a fun and easy time with our kid-made gift mobile project. This Aromatic Ornaments project is a sensory experience for the hands and the nose. Kids will love to mush, pound, and roll the dough. It is even better when what they are mushing, pounding, and rolling also smells good. These Aromatic Ornaments keep their perfume for quite a while. 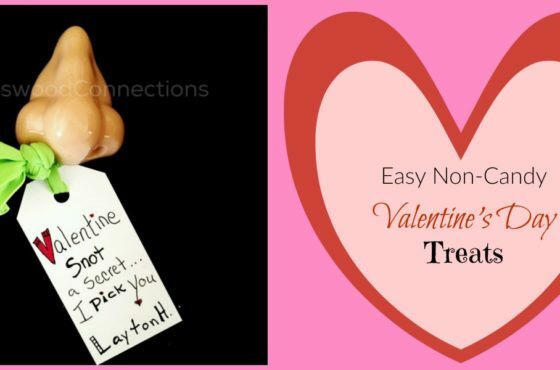 This is a quick and easy way to dress up and personalize candles. 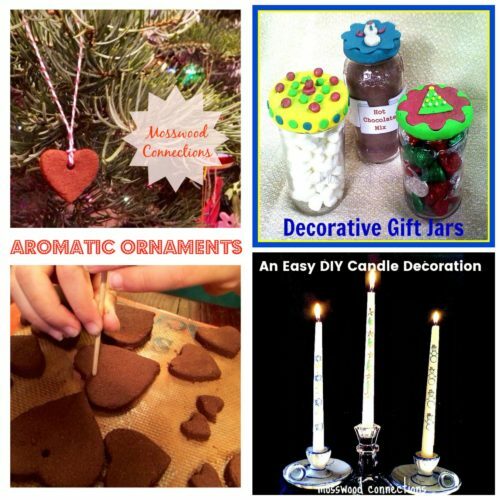 Children of all ages will have fun drawing their pictures to decorate a candle. We made our gift jars for Christmas and Hannukah presents but they can be made for any occasion. They are super versatile and you can personalize them for any special person in your child’s life. 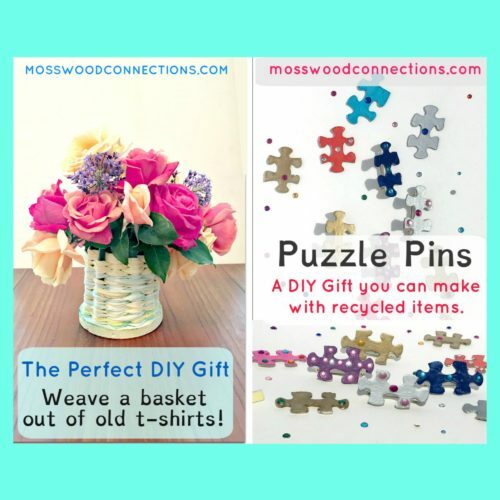 That’s a big part of the fun of this DIY gift, having the children think about the other person and about what that person would like to receive. My daughter made me a puzzle pin when she was in third grade. To this day, of all the gifts she has given me, this DIY gift is still one of my favorites. So when I found a puzzle in my closet with missing pieces I figured I would have the kids that I work with make their own DIY gift for their mothers. The idea for this DIY gift came to us when we were challenged to make a craft out of fabric scraps. We managed to turn an old t-shirt into this beautiful basket. 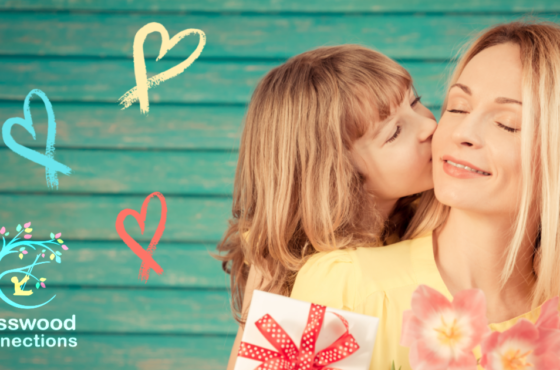 We think the results are magnificent and the perfect mother or grandmother gift. Kid Made Father’s Day Gifts That Dads Will Love! 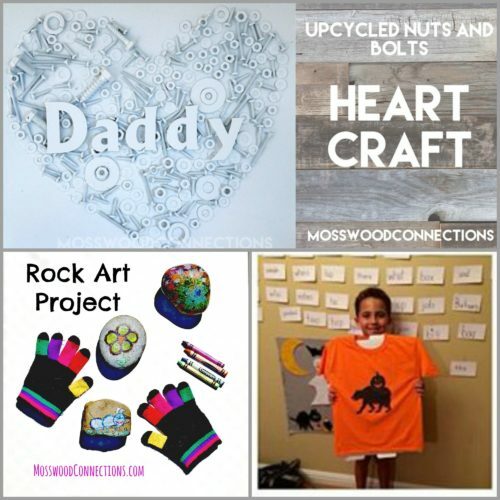 This is our most popular kid-made gift project. We can understand why; it’s fun and easy to do and you can easily personalize for any dad. 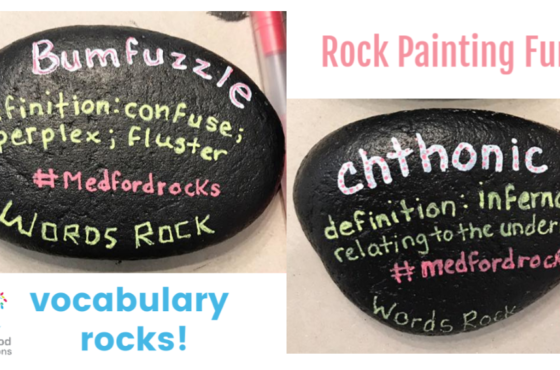 This is an easy rock art project that keeps kids busy and it makes a great gift or DIY garden decoration. Kids can decorate a shirt that any dad would wear with pride. 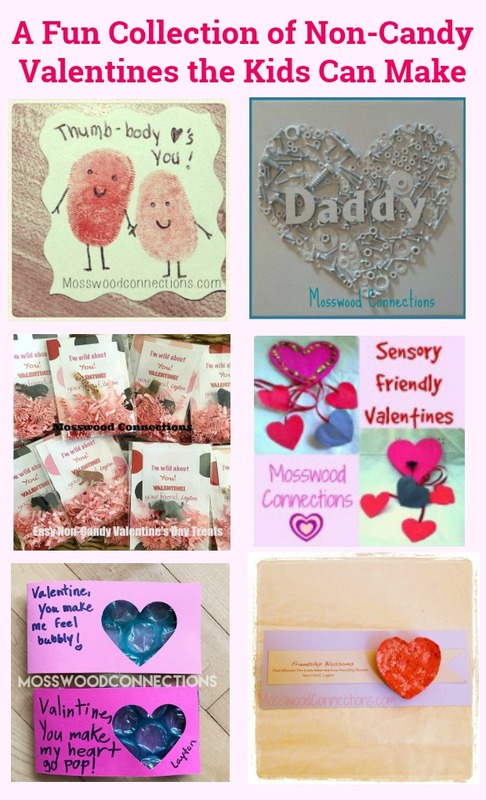 We have a large selection of homemade non-candy Valentines that the kids can make for the special people in their lives. Be sure to check it out! 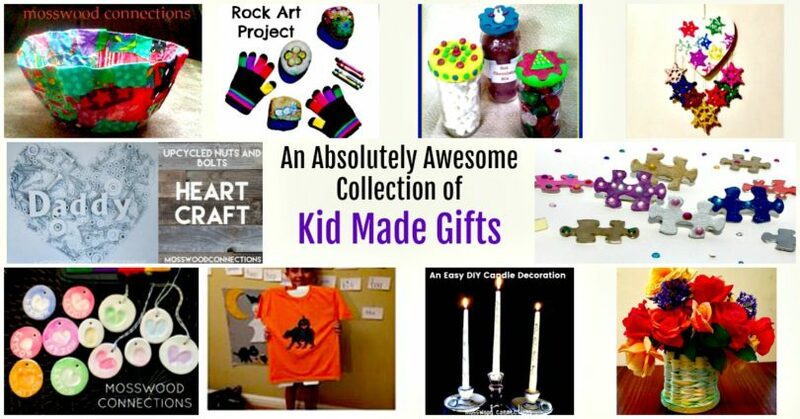 What a fabulous collection of kid made gifts. I love the mobiles and the fabric bowl!